Germany isn't often associated with cricket, though in fact a German cricket club was founded in Berlin in 1850 (by English ex-pats natch) and there are a number of regional leagues. With the great reduction in British troop numbers since re-unification, interest in cricket in Germany has dwindled somewhat. Here is a link to the Berlin Cricket Club website, just in case you landed here from Google and you are disappointed not to find elegies to the crack of leather on willow. But I ain't here to talk about some boring Middle-England village green pastime, I am here to show you photos of a visitor to our living room last night. 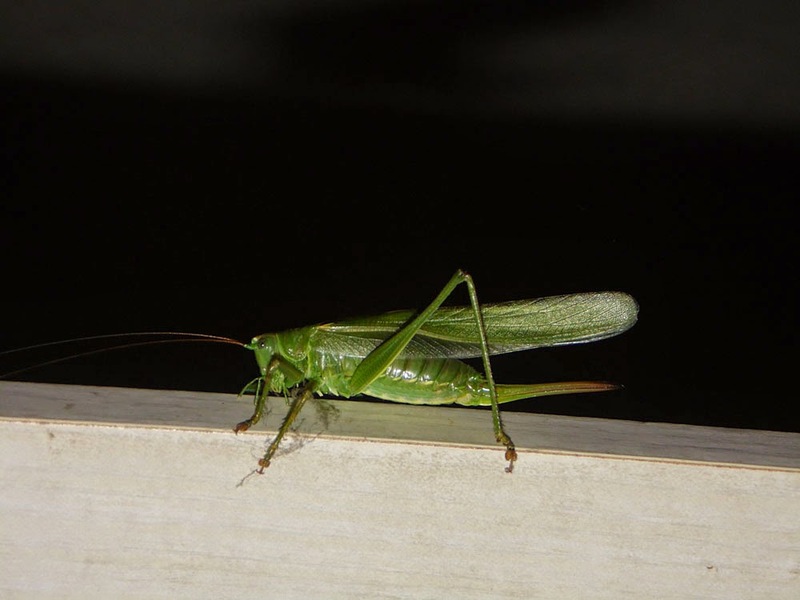 At first we thought it was a grasshopper. 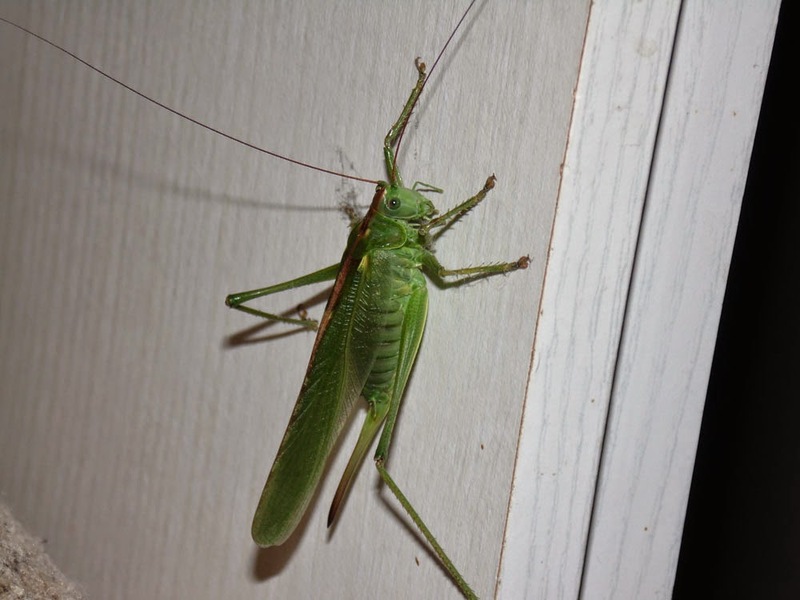 But actually it is a cricket, probably Tettigonia viridissima or the great green bush-cricket. You can tell crickets from grasshoppers because crickets have long antennae whereas grasshoppers have stubby ones, and this girl has a lovely long pair of them. You can tell that she is female by the long ovipositor - the spike on the end of her abdomen with which she deposits her eggs in the soil. In German, they are called Grüne Heupferd (green hay horse) or Grüne Laubheuschrecke (green foliage hay shocker!). Note that a Schreck is variously a shock, fear, scariness and terror, so the Green Shrek in the film series is aptly named. Bush crickets are common across Europe, but it's not often you get them in your Wohnzimmer. This one is about 2 inches long so we soon knew about her when she flew in. Bush crickets might be a bit scary-looking (schrecklich), but they are harmless, and I picked her up without fear and released her back into the night. My partner has a professional photo of a bush cricket (Tettigonia viridissima) that she photographed on a laburnum flower last year which you might be interested in if you want to buy the publication rights. Plug, plug.